Crystals have been used to protect from harm and enhance mental and psychic abilities since the early stories of Atlantis. For thousands of years, crystals and gems have shown physical, mental, and spiritual healing for those who take advantage of their specific benefits. It is the vibrational frequencies of the stones that produce the desired effects. By placing crystals in strategic locations throughout your living space, you can heal self-esteem, encourage love and romance, and protect your loved ones from negative energy. Contact a live psychic online for help in deciding exact locations for use of crystals in your home. Here are just a few ways you can use crystals for better health and happiness. Everyone wants to keep the spark alive in their romantic relationship. One of the best ways to encourage Cupid to keep shooting arrows is to place two rose quartz hearts in the southwest corner of your home. 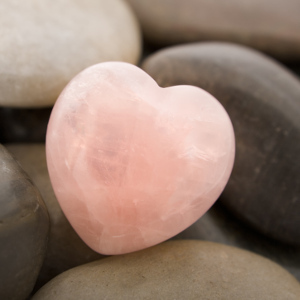 Rose quartz helps encourage happy energy in a relationship of love. Many couples find further enhancement by placing a bowl of rose quartz crystals on a nightstand in the bedroom. Hematite is an excellent stone for grounding and centering the energy of a child. Place several pieces of hematite in the west area of your home for the benefit of all your children and in the bedrooms of children who have more difficulty with focus and concentration. Use of hematite not only encourages your children to focus and concentrate for a longer period, but they will add an overall protection over the children, creating a safe and comfortable environement in your home. Used for centuries, black tourmaline is a powerful grounding stone. Electrical in nature, this particular stone provides a connection between Mother Earth and the human spirit. Often used as a meditation stone, it allows for a clear, balanced view of the world. It is especially beneficial for protecting your home from negative energies. To shield your home and take advantage of the powerful energy that this black tourmaline can offer, place a few pieces by the front door in a natural, attractive way. Place them either inside or outside of the door. The important thing is that everyone passes through the stones' energy when entering the home. Blue kyanite reduces stress and promotes relaxation. To receive the greatest benefits of blue kyanite, place it on display throughout your home with clear quartz crystals. The combination of the two energies creates a Zen environment that is free of stress. Use blue kyanite to calm your mind before meditation. The high vibration crystals align the chakras for a more focused state when practicing meditation. There are specific stones used for overall feng shui in your home as well as specific needs such as promoting wealth and productivity and enhancing your psychic ability. Call a phone psychic for more information on what crystals and stones are best for your needs in your home.